I promised a Lake Sakakawea Darkhouse Spearing Report! It’s funny how if you haven’t done something in awhile how exciting and fun it can be! I had the chance to sit in the chair yesterday, and for those of you that guide like I do or take others out fishing knows what I mean. If you have been following my reports and or my Facebook pages I have been in a constant ice battle with the Big Lake for about a month and a half. Well, the lake finally froze all the way over and the back bays that I like to frequent have finally put on enough ice to feel comfortable. As I am writing this report I have a client group sitting in one of the shacks and they just got themselves a nice 12 pound pike for the pickling jar! The pike are reacting to the Lakco Silver Minnow Decoy! For some reason that is old faithful on Sakakawea. Makes sense Witt smelt, Cisco, skipjacks etc. all silver shiny baitfish. 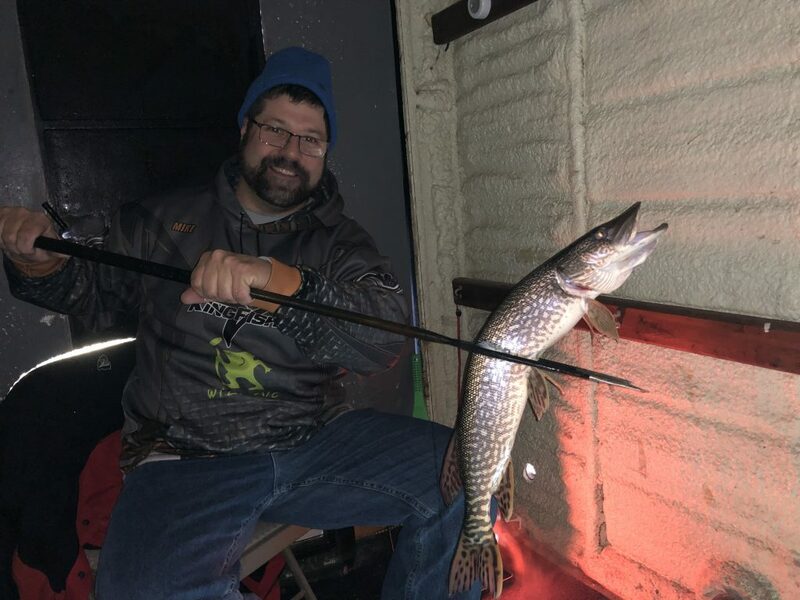 One of the exciting parts of spearing Sakakawea is I feel at any moment you have a crack at a 40 inch plus pike and for sure a crack at a State Record! Hard to beat those odds. Of course there are lakes where you will see more fish, but the quality isn’t abundant. I was set up in 10.5 foot of water and the clarity was excellent! Ice in the bays are anywhere from 12 to 18 inches from our findings. I was fortunate enough to spear one and yes, I also missed one yesterday. All in all it’s just such a rush to watch these freshwater sharks in their environment. If you haven’t sat in a darkhouse I highly recommend giving it a try! It’s sure to make your heart jump out of your chest!